Winchester safes Ranger deluxe Series is an excellent way to keep your firearms and valuable safe from sticky fingers and prying eyes. 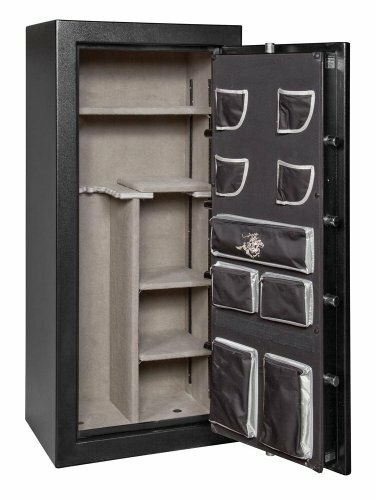 The Winchester safes Ranger deluxe Series is well made using high quality 12 gauge steel for 1 hours of fire protection and exceed DOJ requirements for firearm storage. Like the rest of the Winchester safes lineup, the Ranger deluxe 19 offers a UL (underwriters laboratory) rated lock and has passed the ul’s testing for burglary protection. Now they don’t just hand those Titles out to anybody with a steel box; you have to earn them. And with features like 1.25 inch solid steel locking bolts and a drill-resistant hard plate, the Ranger deluxe 19 is yet another Winchester safe that has done just that.